Astrom Editions AB - Volume XV, 2001. E.T. Bloedow, The agrimi as a potn…a qhrîn Motif in Minoan Glyptic. St. Nikoloudis, Animal Sacrifice in the Mycenaean World. 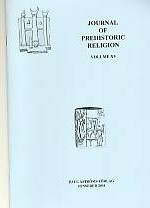 J. Gulizio, A-re in the Linear B Tablets and the Continuity of the Cult of Ares in the Historical Period. A. Krauss, i-je-ro and Related Terms. Redigerad av Paul Åström. 56 sidor. ISBN: 978-91- 7081-113-5.